The Best Books Ever: Top Ten Tuesday: Top Ten things that make our lives easier! 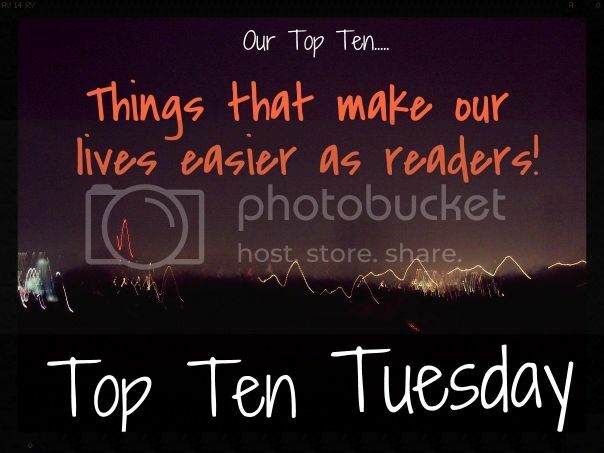 Top Ten Tuesday: Top Ten things that make our lives easier! So this is our first attempt at cranking out a Top Ten Tuesday post. We are hoping to do them weekly, or at least attempt to. Top Ten Tuesday is hosted over at The Broke and The Bookish . Amazon. I know, I know, don't flame me! I get a ton of books from Amazon (mostly from their daily special freebies.) Amazon has been incredibly hurtful in a lot of ways to authors and booksellers, BUT if it wasn't for Amazon- I wouldn't have 30 indie books on my kindle. I wouldn't have any. I can't go to my local Books a Million and pick up an indie novel by someone in Australia. The day I discovered blogs about books existed, I was hooked. I googled a specific book series and stumbled upon the work of YA blogging. Now, it wasn't nearly as big as it is today, but I was so excited to see other adults reading the same type of books as me. I find most of my upcoming books from other blogs and can safely say that they absolutely shape what I read and how much I read. I got my kindle to keep up with all my NetGalley books. (Can you believe I actually read the first 3 books in the Iron Fey series on MY COMPUTER - not a laptop, my desktop computer in our basement? I think I was crazy.) I can't tell you how convenient it is to have my kindle. I can entertain my preschooler and pick up a book wherever I go. I am totally hooked. As much as I love paper books, I love the convenience of having my kindle. I remember as a kid going to the library. I would stack my pile up as high as I could with novels and get to the check out desk. They had an 11 book limit- and I met the limit every time I went. I would go home, and have all of my books read within the first three days. I eventually read almost every book in the library and moved on to the library that was 45 minutes away. I have a huge love for libraries. I really hope one day I can work in a library or get my masters degree in library science. Tumblr! Aside from its plethora of great GIFs, it's also a great resource for following and getting to know other bloggers and authors. Sometimes it's an inside look at the life of an author, sometimes it's strictly about books, sometimes it's reblogging of cool stuff that fans have created. And boy do you learn about a lot of other books you're going to want to read! Like my poor TBR list needs more books! Bookstores that post little blurbs/brief reviews of some of their favorite books. My favorite local small bookstore (shout out to The Book Cellar!) does this and I have bought so many books just based off of some random staff person's recommendation. It's like Goodreads in person, with sometimes dodgy handwriting. Summaries that accurately give you a picture of what's happening in the book. We've all been sucked in by pretty covers, sure, but a good, well-written summary will sometimes make or break my desire to read a book. I've been fooled by tons of books with great summaries but poor execution, or ones where the summary really only barely touches on the plot. There's a fine line between giving too much away and not enough, but if you want to reel in readers, your summary has to a) rock and b) not be full of lies. While I've been pretty lazy with this lately, I used to keep a spreadsheet tracking my review books -- when they were being published, and any notes from the publisher on how early you could post your reviews. It helped me be able to organize the order I needed to read things in and some loose deadlines on when I needed to post stuff. I've been too lazy for that and generally have too many books to review to do that anymore, but still, it made my life easier when I had my act together. I also usually put post-it notes on the covers of my print ARCs with their publish dates so I know when I should have them read by. And the number one thing that makes things easier? Feedback and support from all our awesome readers! We love hearing what you think about our reviews, or hearing about what books you want to read next. Sometimes blogging can be a little isolating, like you're just typing up a bunch of words and releasing them into the big empty void, so hearing from you all is fantastic! What about you, fellow bloggers? What makes your lives easier?